Elmer Johnston arrived from Ontario with his wife and young child as a teamster; established his company in 1913 by leasing 2 floors of a warehouse on Beatty Street then sub leased it to a stove company as dry, secure storage. He leased space on Hamilton Street and had premises on the CNR land at the north foot of Main St in the early 1920s (the company were still operating horse-drawn wagons in 1922) and by 1927 had most of this fine new warehouse on Richards Street where it meets Pacific Boulevard. So far we’ve been unsuccessful at tracing the architect – although it looks like a Townley and Matheson design (similar to the Canadian Linen building a block away that is now the home to Choices Market). In 1912 Thomas Hooper designed a 2-storey $75,000 cold store and warehouse for this corner for Merchants Ice & Storage Company, but nothing was actually built for several years, and we’re not sure if this was a redevelopment or addition to a slightly older building. By 1940 Elmer Johnston was president of both the B.C. Automobile Association and the Vancouver Tourist Association and by 1960 Johnston Terminals Ltd claimed to be “the largest and most diversified physical distribution organization in Canada. . . .” The company still operate in the city today – and the building is still standing as a storage warehouse – but perhaps not for much longer. In 1903 W L Tait, a prominent industrialist and sometime property investor, hired his favourite architects, Parr and Fee, to design a “frame terrace” of six houses built at a cost of $8,000. In 1909 he hired them again to spend an additional $7,000 to alter the building to create an unusual early mixed-use project. Once altered The Orillia, on Robson Street at Seymour, consisted of six rowhouses over a row of retail units. Tait was associated with the delightfully named Rat Portage Lumber Co, and his business and property investments (including The Manhattan, further west on Robson) made him wealthy enough to build his new home, Glen Brae, on Matthews Avenue – these days the house is known as Canuck Place. The Rat Portage name is a name of a town in Ontario (today’s Kenora) and comes from “portage to the country of the muskrat”. There was a lumber concern back east with the Rat Portage name and the BC company was initially associated with it. The Vancouver mill was where the federal fish wharf is next to Granville Island and Tait had a small shingle mill in operation by 1888. This is where the Rat Portage mill was built in 1902, until it burned down in 1933. The Orillia saw a number of tenants over the 80 years it stood, including ‘Sid Beech’s Tamale Parlour’ (with noted Mexican specialities Ravioli and Spaghetti on the menu!) and a pool hall that also sold cigars. Towards the final years of its existence the Orillia had both the Funland Arcade and Twiggy’s Discotheque where the pool hall had once been located. We’ve also been reminded to mention that the building was home to Faces – the gay bar that was home to the best Saturday-afternoon tea dances Vancouver boys have ever experienced, and just one of about a half dozen in the immediate neighbourhood. In 1985 it was demolished, replaced in 1989 by a 16 floor office building designed by Hamilton Doyle and Associates, sometimes called Vancouver House, but more often just 605 Robson Street. Beyond the Orillia you can see BC Telephone’s William Farrell Building, already nearly 20 years old in this 1961 VPL picture. Today the building is still there, but about 3 feet bigger with the installation of Canada’s first triple-skin insulation system in a ground-breaking energy-efficient design by Busby and Associates in 2000. Here’s another Carrall Street building, to the immediate south of the Glory Hotel. These days it’s called the Abrams Block, but for a short period of its life it was known as the Tremont Hotel. We’re not sure who built it or designed it, but almost certainly it wasn’t John Abrams who now has his name on the building. There were two Abrams brothers with an interest in Vancouver when the city was created in 1886, James and John. Both were both born in Ontario to a Scottish mother and New Yorker father. James was initially a tanner who ended up running a general store in Nanaimo, although he owned property in Vancouver and had partnered with ‘Mr McLean’ in a business which saw $18,000 of losses when it was burned down in the 1886 fire, a few months after it was established. John, the older brother, was also in Nanaimo where he worked as a labourer in 1881. In the 1887 street directory he’s in Vancouver running Abrams and Co on Carrall Street, a furniture dealer, and a year later he’s running the Tremont Hotel. The Hotel, was also on Carrall (although the directory calls it Carroll) and in 1887 was being run by C R Cartier. Actually it was C L Cartier – the L stood for Louis and he ran the Tremont House Hotel with his brother, Homisdas, while Homisdas also working as a watchmaker and jeweler. In 1888 John Abrams appears to be running the Tremont Hotel, and then in 1889 in a confusing move Mrs SE Manual has the Tremont Hotel at 14 Carrall (although W J Manual is listed as proprietor) and Scott and Clancey are also listed as the proprietors of the Tremont Hotel at 16 Carrall Street. John Abrams once again has a furniture and crockery store this time on Cordova Street but he also has a clothing house as Abrams & McLean at 14 Carrall Street, and a year later he’s running the Alhambra Hotel. The Tremont Hotel had actually existed before the fire. 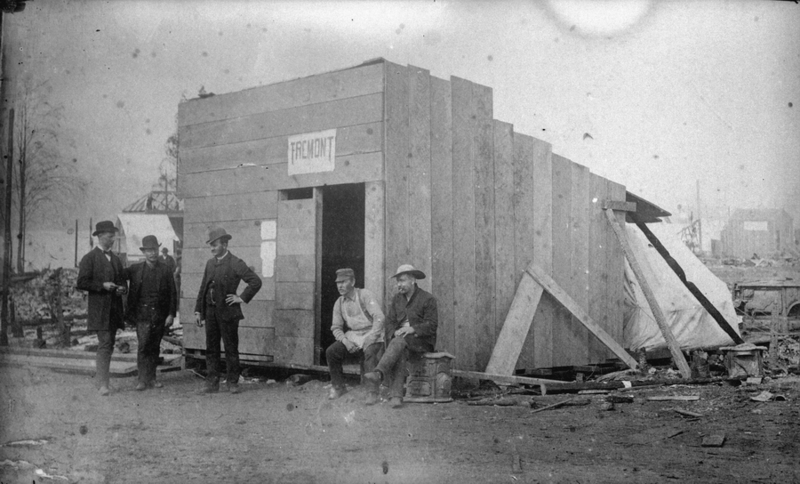 Like every other building, it burned to the ground, and four days later a rough lumber substitute had been erected to allow the shocked citizens to legally get a drink. Not long after a more permanent brick structure was built – although generally thought to date to 1887 at least one of Major Matthew’s interviewees thought it was the first brick building up after the fire (as did John Abrams Daily World obituary in 1893). George Gordon recalled the owner of the original Tremont Hotel to be an old sea captain, Captain Clements, who married a Mrs Farron. Captain Clements ran the Tremont bar (easily confused with the hotel) on Alexander Street in the late 1880s. By 1893 the Tremont appears to have morphed into the Freemont, and then later the Kings Hotel and finally the Spinning Wheel Cabaret. When our image was taken in 1978 it had seen better days. The single room occupancy rooms were closed in 2002 – there were 27 rooms sharing one bathroom. After nearly ten years a Merrick Architecture designed restoration saw a significant seismic upgrade and the rebirth of the building as rental live/work units and office space over the relocated Irish Heather pub. Parts of the Glory Hotel date back to the rebuilding of the city soon after the 1886 fire. The site had a number of businesses by 1890 in a single storey structure owned by A G Ferguson who also owned the building at No. 2 Carrall Street and the site next door that he added to in 1889. Businesses included coal wholesalers and teamsters at no. 6 and the Royal Tea Co at no. 8. In 1909 Frank Filion hired Parr and Fee to remodel and add a two storeys of hotel above the stores. They used their trademark white glazed bricks and centre-hung windows that are found in most of their hotel buildings along Granville Street. Filion and his wife Hanah were from near Montreal in Quebec, and had been in the city since 1891 (arriving from Port Arthur). Mr Filion’s first Directory entry was in 1892 when he was a grocer with Mr W L Davis at 109 Carrall Street. He appears to have replaced Mr Chilberg who was Mr Davis’s partner in the business as far back as 1888, although in 1890 Mr Davis was in business on his own with Mr Chilberg having set up his own grocery operation right across the street at 112 Carrall. Filion bought Davis’s interest in 1893 and in June 1895 moved to 204 Carrall Street, where he was described as “carrying a very desirable stock of goods”. The upstairs premises weren’t always called the Glory Hotel. In 1910 they were called the Beaver Rooms, and there were two stores, Frank Filion and Max Freeman’s clothing store. (At this point the address had become 204 and 206 Carrall Street). The Beaver Rooms (not to be confused with the Beaver Rooming house on East Hastings) were run by W S Wainwright. In 1920 the Beaver Rooms were still over Filion’s grocery store, but next door was a barbers and a billiards room. In 1925 the barbers had become the Stockholm Cafe. In 1927 Miss Jinde was running a barber’s in 204, which she was still doing in 1940. By 1930 the Beaver Rooms had been joined by the Beaver Pool Hall and the cafe was now the World Cafe. When the name changed to the Glory Hotel isn’t clear – by 1947 they were known as the Carrall Rooms, but our 1978 photo shows them as the Glory Hotel, as they are today as a privately owned single room occupancy hotel. 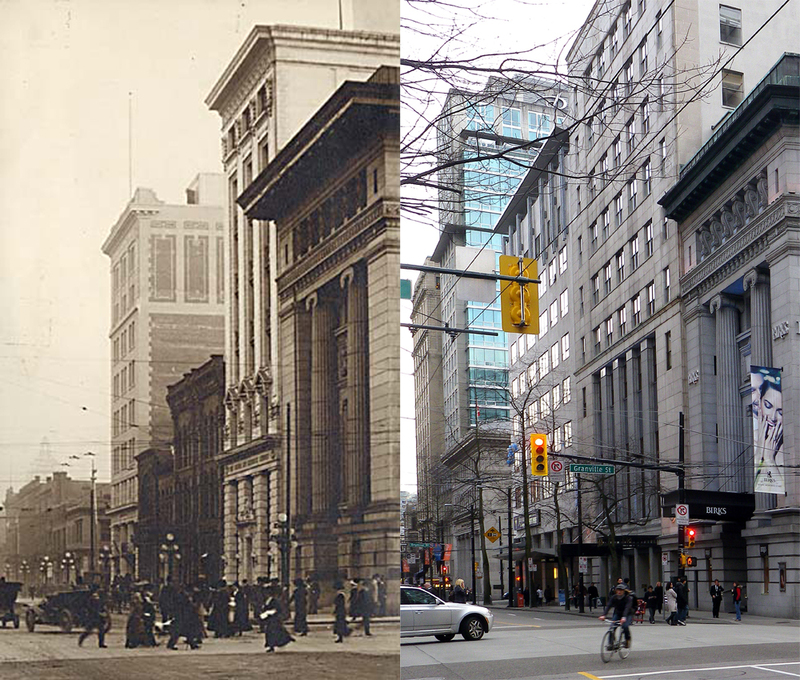 Here’s the Bank of Ottawa on the corner of Seymour and West Hastings in 1912. The new eight storey building was designed by W Marbury Somervell, but probably slightly changed by Somervell and Putnam (as it has a 1911 building permit in their name). It cost $225,000, and pictures of the construction show a reinforced concrete frame rather than all steel. The building bears a very strong resemblance to the BC Securities Building which is three blocks away and completed a year later to HS Griffith’s design. The speed that construction could be completed on commercial buildings can be seen from the Contract Record report of September 1910. Work was just starting on the building site, clearing the existing buildings and excavating the basement, and it was expected the whole thing would be complete by May 1911, with occupancy coming a month later. There were 16 offices per floor above the banking floor, and the quality of the building was obviously aimed at all the other office buildings competing for tenants “The entrance to the vestibule and lobby will be handsomely done in marble, while the floors above will be trimmed throughout in birch and finished with mahogany. Other features of this latest addition to Vancouver’s tall buildings will be a vacuum heating system throughout, hot and cold water in all the offices, the Durham plumbing system, mail chute equipment, vacuum cleaning system for all the offices, and commodious toilet rooms on every floor.” The successful contracting bid came from McDonald and Wilson who started work in October 1910 and as far as we know completed on time. In 1919 the Bank of Ottawa were merged with the Bank of Nova Scotia, and it stayed a branch of the new owners for over 30 years. In 1956 noted local architects Sharp, Thompson, Berwick and Pratt were given the design job of enlarging the bank building. 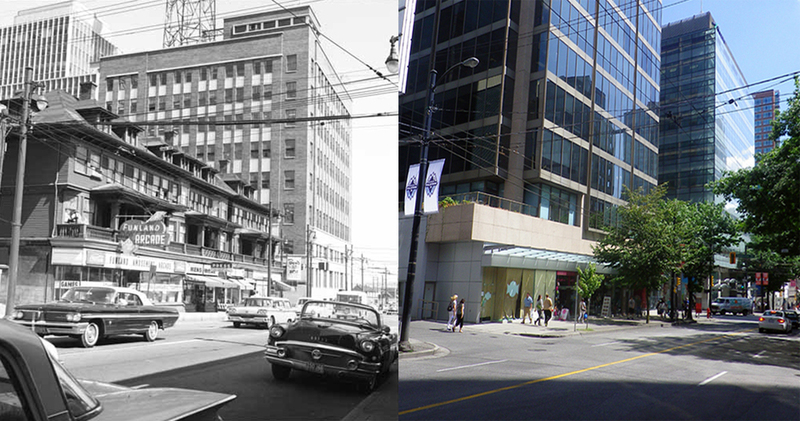 The new project stripped the old building to its frame, replaced the small tobacco store with the billiards room behind (The Maple Leaf Club in 1946) that was next door and the restaurant with rooms over beyond that, and created a simple new office building which was nearly twice the size of the original. A more recent building upgrade in 1987 added an elegant projecting metal cornice to the building. Here’s the 600 block of West Hastings early in 1910. At the eastern end of the block, on the corner of Seymour Street the Bank of Ottawa is under construction to the design of W Marbury Somervell, one of only two buildings he designed before he teamed up with fellow American John Putnam (although a 1911 building permit has both names attached). Their design was quite similar to – but somewhat taller than – the Darling and Pearson designed bank on the other end of the block. This Bank of Commerce commission was completed by the Toronto-based architects in 1908. Today it is home to Birks jewelers, with a more recently recreated ‘heritage’ interior designed by Oberto Oberti in 1994. 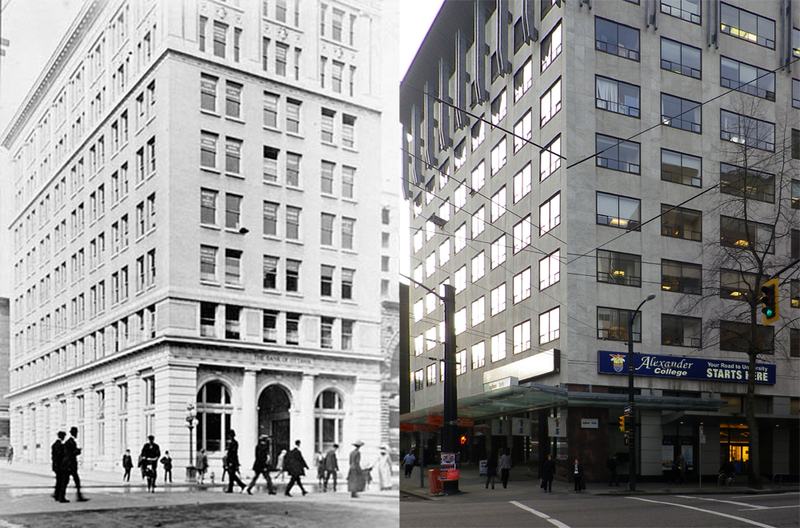 Next door was the Canada Life Building, completed in 1910, and next door to the east was the Strand Hotel, in this picture as it looked after it was remodeled in 1907 to J S Pearce’s design. There’s a permit issued to ‘Darling and Pearsen’ for a Canada Life office in 1910, but all the contemporary records of construction progress reference A A Cox as the architect – it’s probable that Cox was the local supervising architect of Darling and Pearson’s design (although Cox also designed buildings of a similar scale on his own – like the Carter Cotton Building). Today both the Bank of Ottawa (which soon after became the Bank of Nova Scotia) and the Canada Life building are still standing. Or at least, the building frames are still standing; both buildings were increased in width and given a contemporary skin. The Canada Life Building was rebuilt in 1952 and the Bank of Ottawa earlier, in 1950.